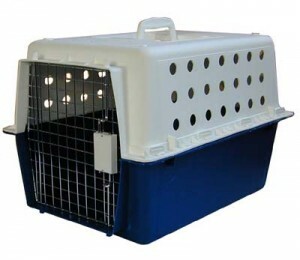 The Ragdoll is a truly remarkable cat that absolutely loves their human companions and want to spend time with them. They quite often greet you at the door when you come home and it is not uncommon for them to follow you all over the house, even to the bathroom. If they have been asleep and wake up they will often call looking for you. They can be taught to walk on a harness, to fetch and even beg. 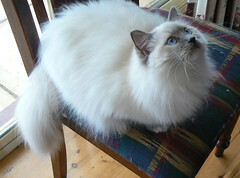 Ragdolls were first bred in the 1960s by Ann Baker, a Persian breeder in California. Some of the original stock consisted of sturdy, free-roaming cats. It is thought she created the foundations of the Ragdoll breed by selecting kittens out of Josephine, a semi-feral longhaired white female Persian/Angora type, sired by several unknown male Birman-like or Burmese-like cats, one with Siamese type markings. Out of those early litters came Blackie, an all black Burmese-like male and Daddy Warbucks, a seal point with white feet. Daddy Warbucks sired the founding bi-colour female Fugianna, and Blackie sired Buckwheat, a dark brown/black Burmese-like female. Both Fugianna and Buckwheat were daughters of Josephine. All Ragdoll cats are descended from Ann Baker’s cats through matings of Daddy Warbucks to Fugianna and Buckwheat. By selecting individuals with the look and temperament she wanted for her breeding program, Ann Baker created the standard Ragdoll type. Denny and Laura Dayton are credited with bringing the Ragdoll breed to worldwide recognition by various cat registration organizations. What is known is that this breed was selectively bred over many years for desirable traits, such as large size, gentle demeanour, and a tendency to go limp when picked up. The Ragdoll has a very gentle and relaxed temperament. If socialized correctly from birth they will be very friendly members of the family, that are very welcoming to strangers and love being held and snuggled by people of all ages. They are an ideal pet for young children as they tolerate and appreciate lots of hugs and kisses, and can withstand a young child’s exploration and behavior toward them. They are suitable for all ages whether young or old. The Ragdoll comes in a number of colour and pattern combinations. The following guide will give you a good understanding of each variety. 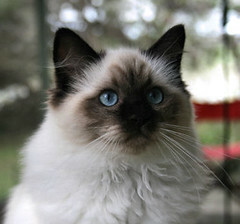 The Seal colour is used to describe Ragdolls that have points which are a dark, rich brown in colour. The body colour of a seal Ragdoll should be a fawn to cream with shading over the back although sometimes it is possible for them to be a little darker. The nose and paw pad will be dark brown colour. The Chocolate colour is similar to seal although their points will be a light milk chocolate colour. The Blue colour refers to Ragdolls with points that are slate blue or silver / grey. The body colour can be ivory or almost a blue-white and the nose and paw pads should be slate blue coloured. The Lilac colour is characterized by the points being a lilac to pink-beige. Body colour will always be milky white and the nose and paw pads are mauve to lavender shading. The Red colour (also known as Flame or Apricot) will depict Ragdolls that are displaying a reddish almost Apricot hue to their points. The body colour is a pale cream or off white and the nose and paw pads are always pink. 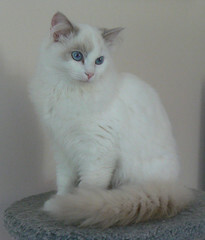 The Cream colour refers to Ragdolls that have a somewhat paler cream appearance to their points.